Aurora and Shane’s Story – "I KNOW TORONTO!" The area we were looking in was roughly Dundas to Dupont between Bathurst and Dufferin. We were especially interested in the areas around Palmerston and Dupont, College and Dovercourt, and High Park/Roncy. It was important, first and foremost, that we be near transit – subway or streetcar. And, also family-friendly, shops and restaurants, parks for sure. Living right downtown has been great, but we really wanted the feeling of a neighbourhood, with lots of green and fairly peaceful, but still not too far away from everything. We needed around 3 bedrooms – definitely 2, but towards the end of our search, Shane was recruited for a new job that has him working from home part of the week, so we wanted a guest room and a room we could use as an office. We were also on the lookout for a place that had a basement suite, or a basement that could be turned into a rental unit. Our new home has this, and it has enough room upstairs that we don’t need the basement space. Not a lot of places we looked at had this much space. 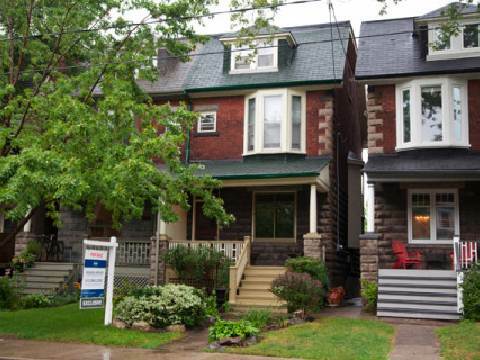 We eventually found our house in Roncy. The house we bought is a lot bigger than the ones we were originally looking at, partly because of needing to accommodate a home office in addition to the other rooms we wanted. Our budget did creep up over time, partly because of how crazy the market got. We were willing to do work if a place had good bones – we certainly didn’t want to get stuck with someone else’s renovation that wasn’t exactly to our taste. Part of the reason we picked the house we finally bought was it was more or less move-in ready, and the kitchen and bathroom have been recently renovated in a style and with fixtures that we love. We give a lot of credit to Shawn for being so patient with us – we looked off and on for years, and he never rushed us.